A couple of years ago, there was not a good place for fairies at the Mountains Branch Library. There were some flowering trees and a few bushes behind the library, in Rutherford County, east of Lake Lure. 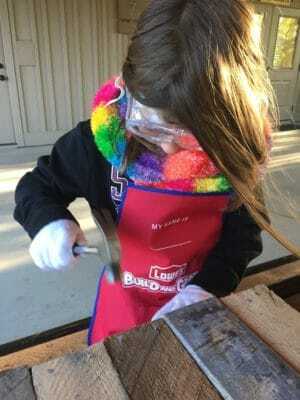 But, the ground used to be pretty bare, says seven-year-old Delaney Cullen. “I didn’t like that it was just red clay,” she says. She thought there could be something better there—a garden. They would grow food for people. There would be stepping stones and tunnels. Birds, bees, and butterflies would come. Lizards could live among the rocks. 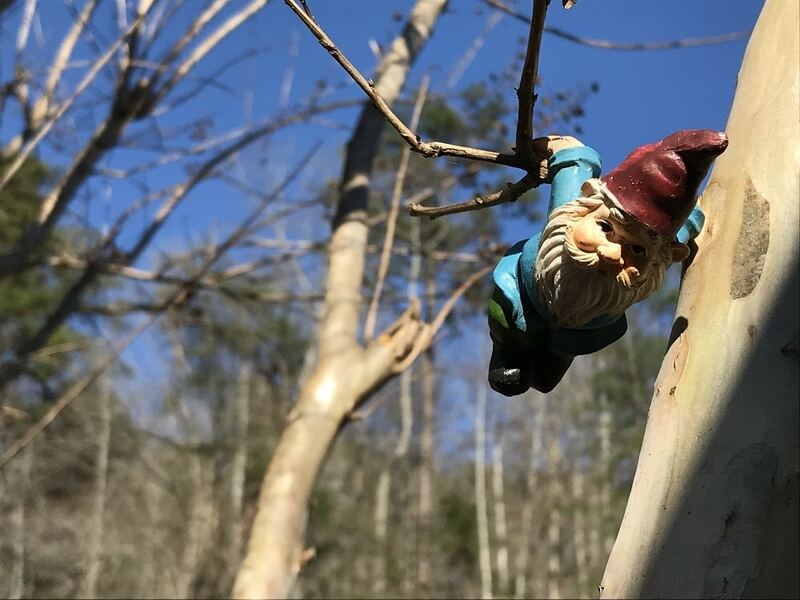 There would be hidden gnomes for people to find. And a fairy garden. At the time, she was just five. How was a little kid going to do all that? In this video from 2017, five-year-old Delaney talks about her vision for the garden. Delaney’s mom, Cathleen, is an early childhood educator and her dad, John, is an environmental educator. Together, they founded Life Roots, LLC. Originally from Massachusetts, they had been living in Charleston, SC—but they wanted to move closer to the mountains. Four years ago, they bought five acres in Sunny View, in Polk County, where they pursue their interest in permaculture, raising chickens and a garden. “We have our own piece of heaven,” John says. 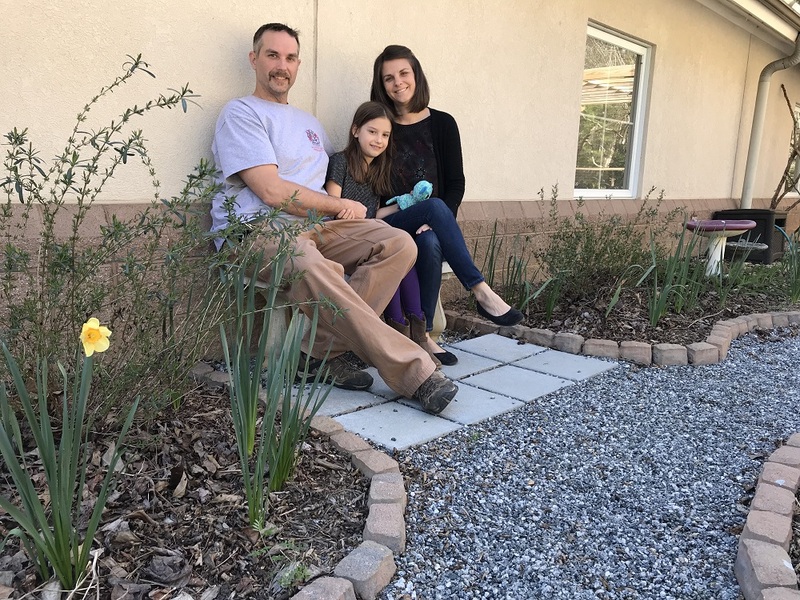 During the Party Rock fire, John wanted to go up the mountain to fight the blaze but he wasn’t trained for that, so he and Cathleen coordinated donations of supplies for evacuees and emergency workers instead. Afterward, John says “I wasn’t done giving to the community”— so, he joined the local volunteer fire and rescue squads. The family, with Delaney, also volunteered fostering shelter animals and supporting food plots in low income neighborhoods. Sitting at a picnic table at the library this March, John described how, when Delaney was four, she wanted to take part in a workshop with local cartoonist Steve Barr. Meanwhile, the family frequently visited their local library. They talked with Joy about her vision for the library as a community hub that engages people with reading, nature, and art. John was leading environmental education programs at the library and thinking about how to enhance natural areas on the site. 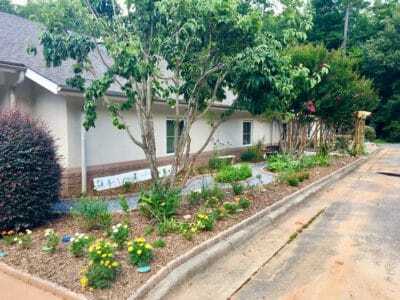 There was a steep mowed bank beside the parking lot—maybe they could plant an orchard there? Delaney asked why they couldn’t grow a garden by the back door instead. “Well, why not?” John responded. So, when Steve let them know that the Pollination Project—which gives small grants every day to change-makers across the world—was looking for young people with positive ideas, they applied for a grant. 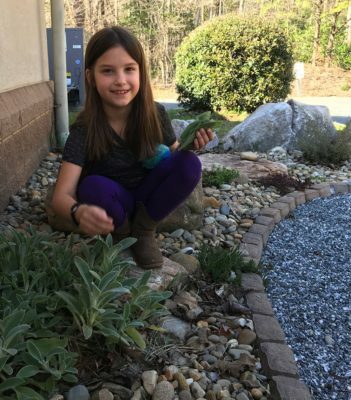 At six, Delaney was the youngest person in the world to receive a Pollination Project grant. 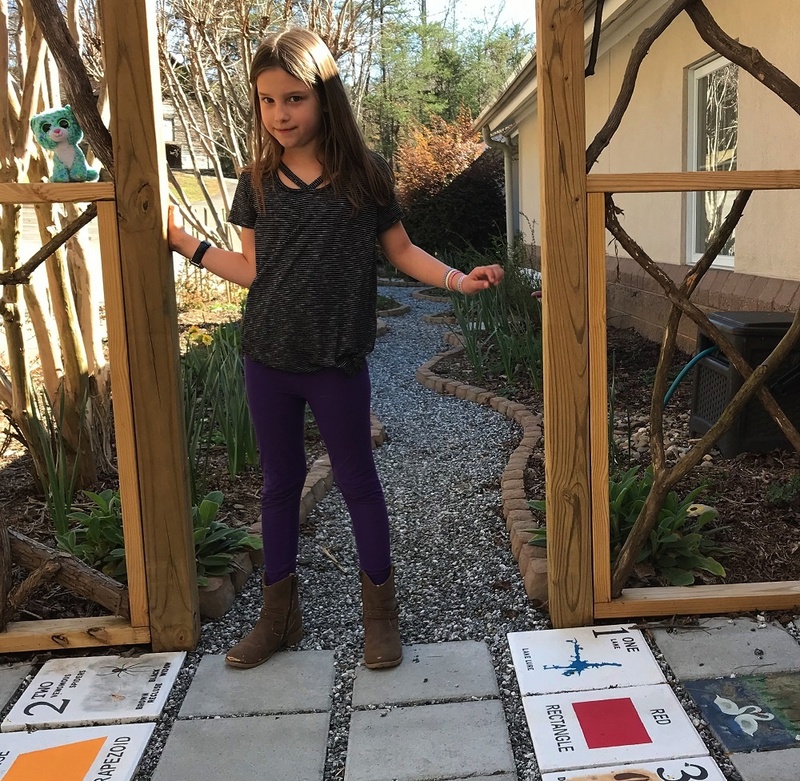 They called her idea “The Little Garden That Grew.” Delaney wanted to make a garden at her library, then a garden at her old school, then a garden at her new school. But to create even one garden, they’d need some support. Two grants—from the Pollination Project and the the Hickory Nut Gorge Foundation—provided $1,800. But plans for the 1,400-square-foot library garden would take $8,000 in materials alone: wood for a pergola, plus gravel, pavers, benches, stones, weed control fabric, organic soil, plants, and more. Businesses donated materials. 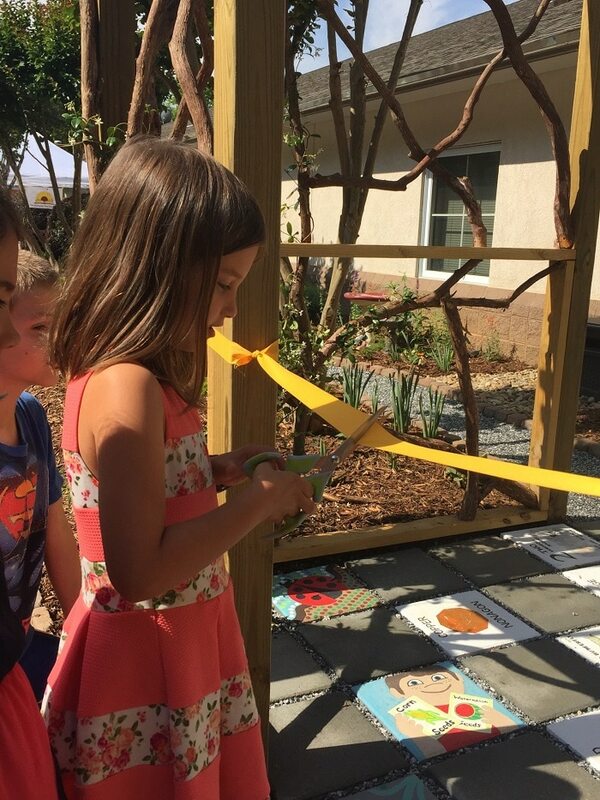 People hand-painted pavers, illustrating concepts like shapes, numbers, butterfly life cycles, or phases of the moon. Volunteers helped build the pergola, make paths, and grow plants. Last summer, the garden was producing flowers, herbs, berries, watermelons, tomatoes, peas, squash and much more—even loofahs. The little garden might keep growing. 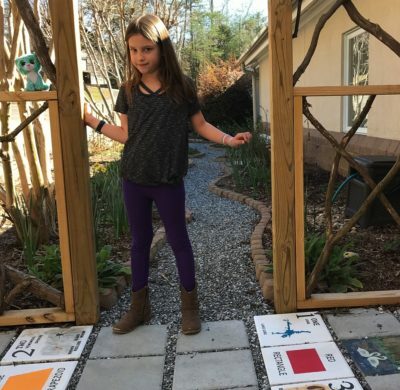 Delaney still wants to start gardens at her schools. And the local health district is interested in creating more gardens like this one that offer people fresh produce for free. A number of toy gnomes are hidden in the garden, but Delaney commented with disappointment that there was not a fairy garden. There were plenty of things you could make one with, though. There was a slanting rock that fairies could slide down. Specks of white quartz gravel, if you lined them up, made a path. The velvety leaves of lambs-ear were perfect for sofas and beds. Carefully placed moss in a tiny plug of dirt would help entice the fairies to this spot. If she was a fairy, Delaney said, she would come out at night. And her name would be Midnight. Delaney picks lambs ear for a fairy garden. This article is by Rose Jenkins Lane, the communications director for Conserving Carolina. She writes the monthly Stories of the Land series which is published in the Hendersonville Times-News.